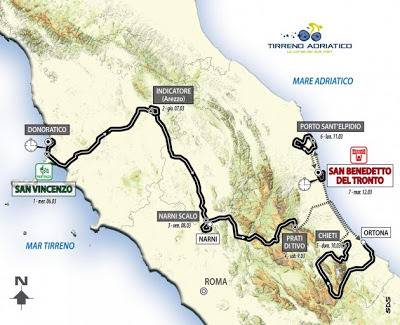 Tirreno-Adriatico, the "Race of the Two Seas", begins tomorrow and will be held over seven days until March 12th. This short stage race wlll test everything covered in the cycling manual: long sprints, short sprints, climbs, team time trials and individual time trials. Last year's winner Vincenzo Nibali will face competition from Bradley Wiggins and Chris Froome (1st and 2nd at Tour de France last year), Alberto Contador, Cadel Evans (winner of 2010 T-A), Vincenzo Nibali, and Moreno Moser who won the Strade Bianche on Saturday. Cunego, Cavendish, Sagan, Rodriguez, Goss and will add to the excitement of the racing. The route for this year is very similar to that of 2012, with the finish at San Benedetto and a short (9 km) individual time trial. There will be tough stages at Prati di Tivo (the only finish on a steep climb, 7.1% avergae, 12% max) and Chieti (where riders have to scale the Passo Lanciano late on in the stage and a 19% finish into Chieti), then Porto Sant'Elpidio and a gruelling ride around the hills of the Marche region. There will be 22 teams taking part, made up of 8 riders each: they'll include the 19 teams of the World Tour (with the Italian Cannondale Pro Cycling and Lampre-Merida teams) plus Fantini-Selle Italia, NetApp and MTN Qhubeka, a new team from South Africa. 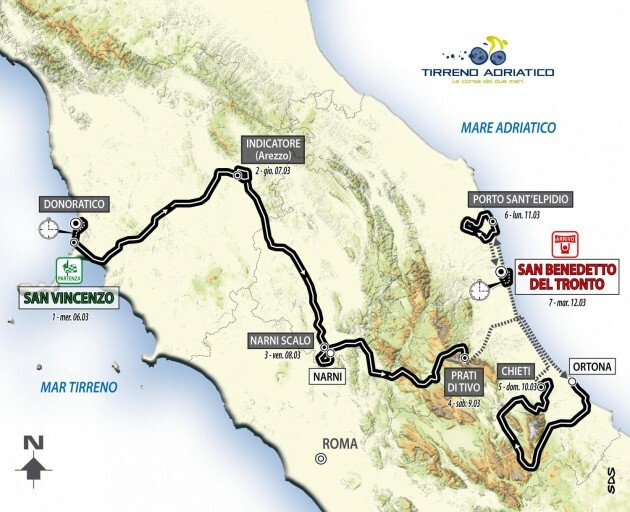 Tirreno-Adriatico is a traditional run-up to Milan-Sanremo which is held the following weekend. Although Milan-Sanremo has usually been held on Saturdays it has now been moved to Sundays (read the three reasons here). Paris-Nice is another short stage race used in preparation for Milan-Sanremo, it started on Sunday and will finish March 10th.